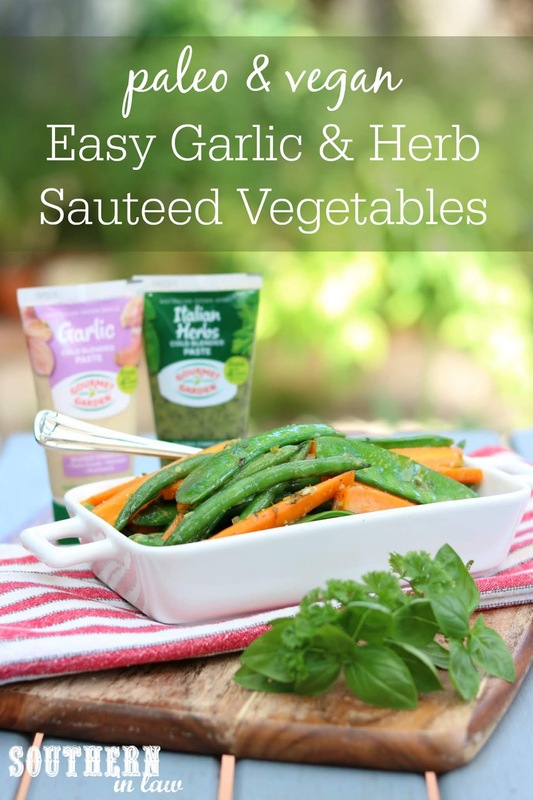 Thanks to Gourmet Garden for sponsoring this recipe! And no, I'm not saying that in a I'm so healthy look at me #clean #eattherainbow kind of way. I really do love vegetables. I'm the kind of person who at Thanksgiving or Christmas, has to sit away from the vegetables because I will eat them all on my own and the second I get home from vacation, you'll find me at the grocery store filling my cart with vegetable after vegetable, anxious to get home to cook/chop/eat them all. But I realise not everyone is like that... especially my husband. You see, Jesse never really grew up eating vegetables, so ever since he moved here, I've been trying to convince him to love them. Sometimes I win, other times... not so much. 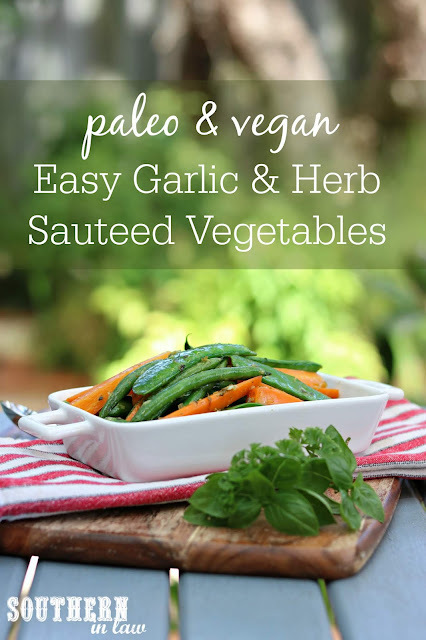 But my mission to get my husband to eat more vegetables has lead to some seriously delicious recipes... and I promise you, these vegetables will be loved by even the biggest vegetable haters. Best of all? It's a side dish that takes just minutes to make... and there's two secret ingredients that make this recipe even simpler! Wash, chop and peel your vegetables as desired. 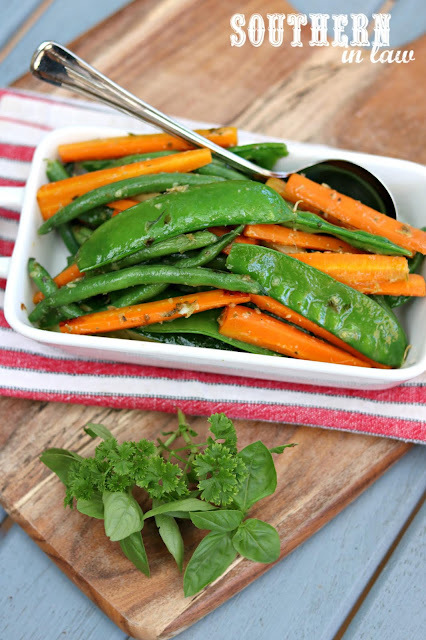 We like to use whatever we have in the fridge, but our top favourite vegetables to use are carrots, green beans, snow peas and zucchini. Lightly steam your vegetables until almost cooked through (you can do this in a traditional steamer or in the microwave in a microwave safe container with a little bit of water. Microwave for 2-3 minutes or until almost cooked through). Place a clean saucepan onto the stove and heat over a medium-high heat. Add a squeeze of each of the garlic and herb pastes and season to taste with salt and pepper. Cook over a medium high heat, stirring frequently to prevent the vegetables from sticking and ensuring that the herbs evenly coat the vegetables. Cook until your vegetables are lightly browned and the garlic is cooked and fragrant. And there you have it, the easiest veggie side dish recipe in the world! If you don't have or can't find the Gourmet Garden pastes, don't worry! I made this previously with fresh herbs and fresh garlic but now use the pastes because it's so much less waste than buying herbs or growing herbs (that always die) and having to throw them out when they're not used in time. If you're in Australia, the Gourmet Garden pastes are available in the fresh produce section of Coles and Woolworths. But tell me, are you a veggie hater or veggie lover? And what's one food you WILL NOT EAT? For me it has to be blue cheese. I love all kinds of cheese (even the stinkiest of cheeses) but blue cheese? BLEEEUUGH! It has a gross sweetness/horribleness that I just can't do.